Habit: Biennial. Stem: 1--several, branched distally. Leaf: basal and cauline, alternate, long-petioled, widely ovate; base deeply cordate; margin entire or toothed; gradually reduced distally on stem. Inflorescence: heads discoid, in leafy-bracted clusters; involucre +- spheric; phyllaries graduated in many series, +- linear, bases appressed, tips stiffly radiating, hooked-spiny; receptacle +- flat, epaleate, bristly. Flower: many; corolla pink to +- purple, lobes narrowly triangular; anther base tailed, tips ovate, acute to obtuse; style branched just above distal hairy ring, branches oblong, obtuse. Fruit: +- compressed, rough or ribbed, glabrous, attachment basal; pappus several series of rough bristles, readily deciduous. Habit: Plant <= 15 dm. Stem: branches stiffly ascending. Leaf: blade <= 80 cm, green, abaxially +- gray-tomentose, adaxially puberulent or soft-hairy, becoming glabrous. Flower: corolla 8--10 mm. Fruit: 4--7.5 mm, dark brown or dark-spotted. Chromosomes: 2n=36. 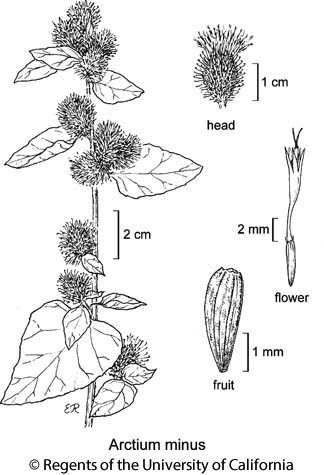 Citation for this treatment: David J. Keil 2012, Arctium minus, in Jepson Flora Project (eds.) Jepson eFlora, http://ucjeps.berkeley.edu/eflora/eflora_display.php?tid=1083, accessed on April 20, 2019. NW, n ChI, MP; Markers link to CCH specimen records. Yellow markers indicate records that may provide evidence for eFlora range revision or may have georeferencing or identification issues. Purple markers indicate specimens collected from a garden, greenhouse, or other non-wild location.